Microsoft is getting aggressive with its campaign to upgrade people to Windows 10. If you want to banish these system prompts for all time, try a little program called GWX Control Panel. Upgrading to Windows 10 is a great idea for most people. The operating system is fantastic and far more natural to navigate on a PC than Windows 8. It's also more advanced than Windows 7 in many respects. The first thing you need to do is download the GWX Control Panel installer from UltimateOutsider.com. The program should start automatically after installation. If not you'll find it on the All Apps screen in Windows 8 and under All Programs in the Windows 7 Start menu. Once it's up and running, you'll see a set of questions with yes/no answers. You'll want to pay attention to these questions as they will help you understand if the Windows 10 upgrade app is running if upgrades are allowed, and whether any Windows 10 download files are present. After surveying your status, you simply have to click a few buttons at the bottom of the window to prevent your upgrade. The first thing you should do is the click the button labeled Click to Disable 'Get Windows 10' App. Once that's done, you should no longer see the pops-up constantly nagging you to install Windows 10. That's not enough, however. All we've done so far is stop the visual prompts to upgrade to Windows 10, but there's a lot more going on behind the scenes. Next, we're going to plug up any holes in your system settings that Microsoft can use to send Windows 10 upgrades to your PC. That's done simply by selecting Click to Prevent Windows 10 Upgrades. Ultimate Outsider also says this feature "restores your Windows Update control panel to its normal behavior" if Windows 10 ads or installers try to hijack it. For most people that should be enough to keep Windows 10 at bay. If you really want to be extra careful you can also choose Click to Enable Monitor Mode. When this feature is active GWX Control Panel runs in the background on your PC and looks for any system changes related to the new operating system. If it finds something it will alert you to the fact that new Windows 10 settings or files are present. Another setting that Ultimate Outsider recommends is the option Click to Disable Non-critical Windows 10 Settings. This may prevent some annoying behavior related to Windows 10 updates, but like monitor mode, it's not a necessity. If you're worried about GWX Control Panel interfering with your security updates that shouldn't be a problem. The program is designed so that it will not prohibit regular updates and fixes. 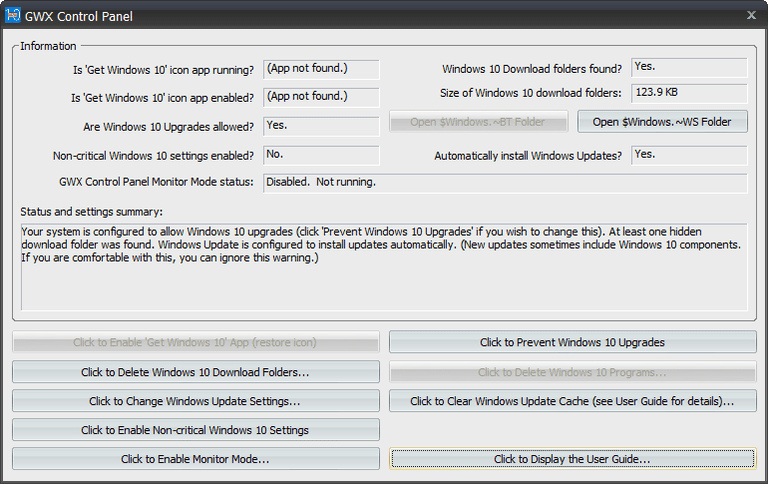 Although it is very effective, GWX Control Panel won't update automatically like most Windows desktop programs you use. Instead, you need to update by downloading the installer from the Ultimate Outsider site. It's probably not necessary that often, but if the Windows 10 update prompts ever return GWX may need an update to deal with Microsoft's latest tactics. The Bash prompt is in Windows 10. Here's how to activate it.